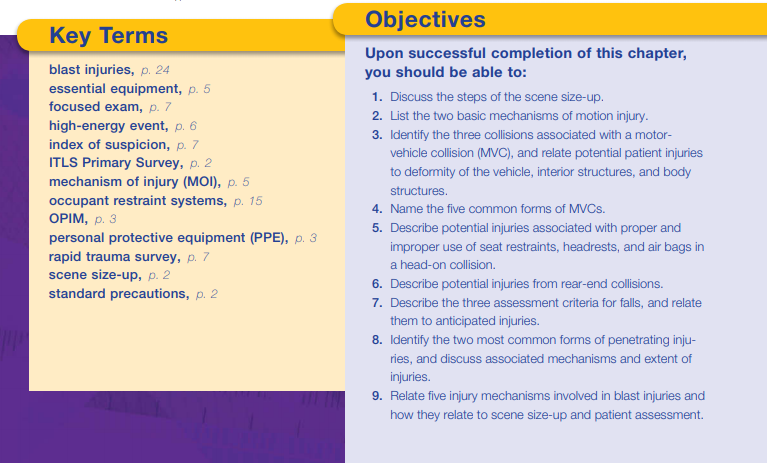 Specifically, this post consists of excerpts from Chapter 1, Scene Size-up, pp 2 – 27.
scene size-up: observations made and actions taken at a trauma scene before actually approaching the patient. It is the initial step in the ITLS Primary Survey. occasionally requires a protective gown. 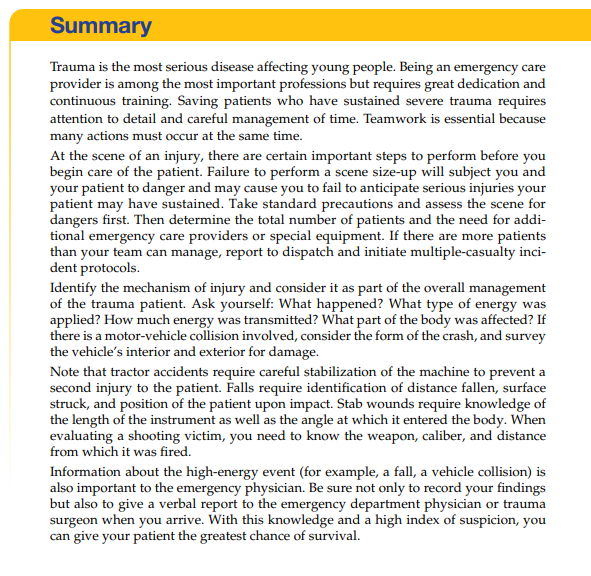 Trauma scenes are among the most likely to subject the emergency care provider to contamination by blood or other potentially infectious material (OPIM). The subject of OPIM will be covered in more detail in Chapter 22. Not only are trauma patients often bloody, but they also frequently require airway management under adverse conditions. Personal protective equipment (PPE) is necessary at trauma scenes. Protective gloves are always needed, and many situations will require eye protection. It is wise for the emergency care provider in charge of airway management to don a face shield or eye protection and mask. In highly contaminated situations, impervious gowns with mask or face shield may be needed as well. In a toxic environment, chemical suits and gas masks may be needed. Remember to protect your patient from body fluid contamination by changing your gloves between patients. Begin sizing up the scene for hazards as you approach it in your vehicle. Your first decision is to determine the nearest safe place to park the ambulance or rescue vehicle. You would like the vehicle as close to the scene as possible, and yet it must be far enough away for you to be safe while you are performing the scene size-up. 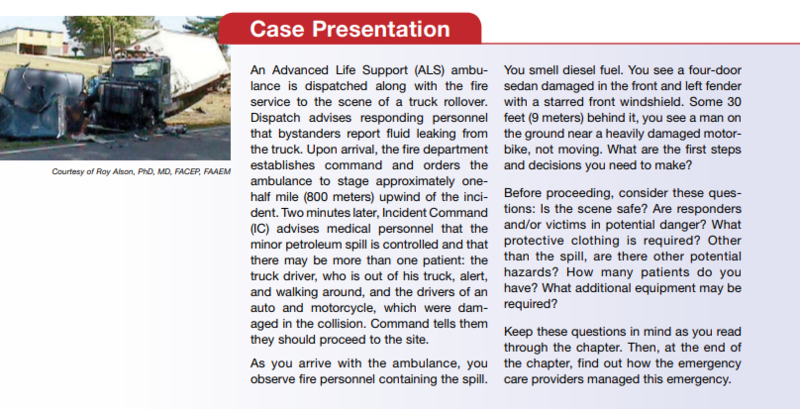 In some situations you should not enter the scene until it has been cleared by fire personnel, law enforcement, or hazmat technicians. . . . Next, determine if it is safe to approach the patient. Perform a “windshield survey” before leaving your response vehicle. Crash/rescue scenes. Is there danger from fire or toxic substances? Is there danger of electrocution? Are unstable surfaces or structures present such as ice, water, a slope, or buildings in danger of collapse? Areas with potential for low oxygen levels or toxic chemical levels (sewers, ship holds, silos, and so on) should never be entered until you have the proper protective equipment and breathing apparatus. You should never enter such areas without proper training, safety equipment, and appropriate backup support. Farms. Silos are confined spaces and should not be entered without proper equipment and training. Livestock also can pose hazards to emergency care providers. Be aware of the machinery present as well as manure pits or ponds. Crime scenes. Danger may exist even after a crime has been committed. Be alert for persons fleeing the scene, for persons attempting to conceal themselves, and for persons who are armed or who make threatening statements or gestures. Do not approach a known crime scene if law enforcement personnel are not present. Wait for law enforcement, not only for your own safety and the safety of victims, but also to help preserve evidence. Do not approach the scene if you see that law enforcement personnel are in defensive positions or have their weapons drawn. Bystanders. You and the victims may be in danger from bystanders. Are bystanders talking in loud, angry voices? Are people fighting? Are weapons present? Is there evidence of the use of alcohol or illegal drugs? Is this a domestic-violence scene? You may not be recognized as an emergency care provider, but as a symbol of authority and thus attacked. Are dangerous animals present? Request law enforcement personnel at any sign of danger from violence. Mass-Shooting Events. Unfortunately, mass-shooting events have become too common worldwide. Classic instructions for emergency care providers have been not to enter the scene until law enforcement has “secured” it, which could take a very long time. Based on the analysis of a number of events, the Hartford Consensus document recommends that EMS responders enter the scene with law enforcement protection, when an area with victims has been rendered “safe,” meaning there are no immediate threats in the area in which EMS personnel are operating. Then control any life-threatening hemorrhage in victims found, and rapidly evacuate them to a safer area for further assessment and treatment. Another type of hazardous scene is the blast scene. Explosions usually are associated with industrial accidents, but because the threat of terrorist activity is both common and worldwide, it should be considered when approaching the scene of an explosion. In addition, in some countries the proliferation of illegal methamphetamine labs has been associated with an increased incidence of chemical explosions. Whatever the cause of an explosion, if possible, law enforcement personnel, along with a bomb technician and a hazmat technician, should first evaluate the blast scene to make sure it is safe to enter and that no chemical, biological, or radiological hazards exist. If possible, park your vehicle outside the blast zone (the area where glass is broken). If you are not sure of scene safety, call for ambulatory victims to leave the scene by following a designated emergency responder to a safe area for triage and decontamination. Next, determine the total number of patients. If there are more patients than your team can effectively handle, call for additional resources. Based on dispatch information and additional information received en route, you may need to do this while still responding to the incident. Remember that you usually need one ambulance for each seriously injured patient. If there are many patients, establish medical command and initiate multiple-casualty incident (MCI) protocols. It is important to be aware of whether the mechanism of injury is generalized or focused. Generalized mechanisms include motor-vehicle collisions, falls from a height, and so on. Focused mechanisms cause injuries to discrete areas of the body, such as a stab wound of the abdomen or an amputation of a foot. 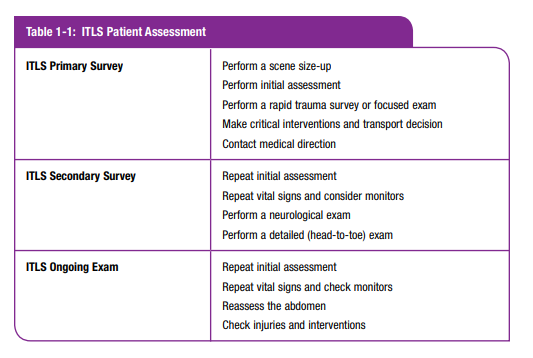 Generalized mechanisms require a rapid trauma survey* of the whole body, whereas focused mechanisms may only require a focused exam**, which is a limited exam of the affected areas or systems. *rapid trauma survey: a brief exam from head to toe performed to identify life-threatening injuries. **focused exam: an exam used when there is a focused (localized) mechanism of injury or an isolated injury. The exam is limited to the area of injury. The mechanism of injury is an important triage tool. It provides information you should report to the emergency physician or trauma surgeon. Severity of vehicle damage has been suggested as a nonphysiologic sign of injury. Taking a few brief photos with a digital camera of the vehicle’s damage can be helpful for emergency department personnel to recognize the severity of forces involved. It is essential to develop an awareness of mechanisms of injury and thus have a high index of suspicion* for occult injuries. Always consider the potential injury to be present until it is ruled out in a hospital setting. *index of suspicion: the medical provider’s estimate of a disease or injury being present in a patient. A high index of suspicion means there is a high probability the injury is present. A low index of suspicion means there is a low risk of the injury. inside the automobile (books, bags, luggage, and other persons) will become missiles traveling at the original speed of the auto and may strike persons in front of them. These are called secondary collisions. 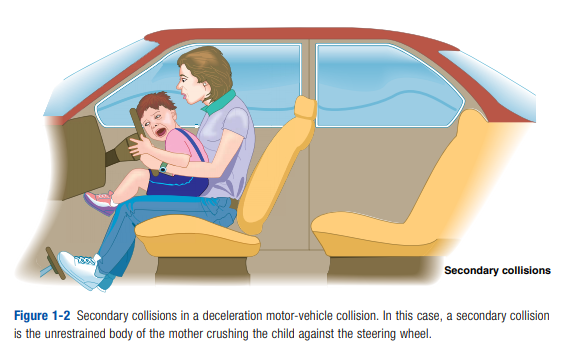 A good example occurs when an unrestrained parent is holding a child in her lap and crushes the child between her and the dashboard in a deceleration collision (Figure 1-2). • Machine collision: Look for front-end deformity of the vehicle. 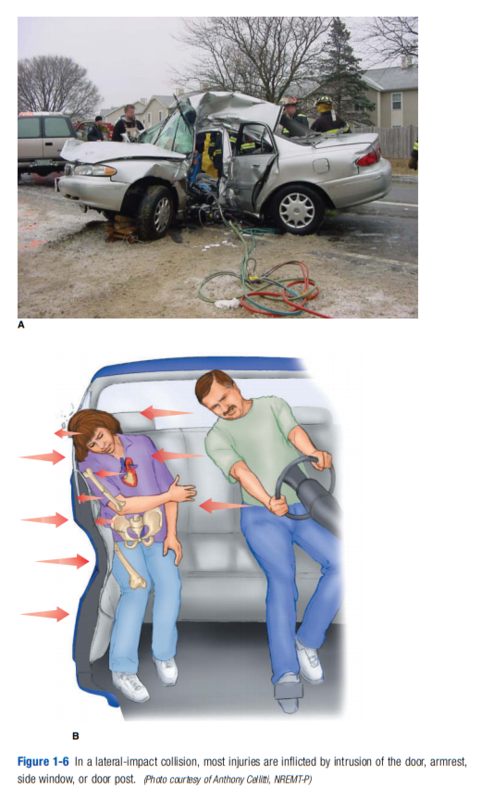 • Body collision: Check the steering wheel for ring fracture and deformity and the column for any displacement. 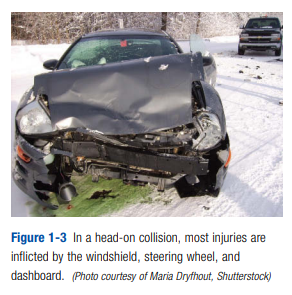 The head-on collision is entirely dependent on the area of the body that impacts with the steering wheel, dashboard, or other portion of the vehicle’s interior. Signs may be readily visible, with direct trauma such as lacerations of mouth and chin, contusion/bruises of the anterior neck, traumatic tattoos of the chest wall, and bruising of the abdomen. These external signs may be subtle or dramatic in appearance, but more important, they may represent only the tip of the iceberg. Deeper structures and organs may harbor occult injuries due to shearing forces, compression forces, and displacement of kinetic energy. shock. Compression injuries are common for the lungs, heart, diaphragm, and urinary bladder. heighten your index of suspicion. You also must relay this information to the receiving physician. Dashboard injuries occur most often to an unrestrained passenger. The dashboard has the capability of producing a variety of injuries, depending on the area of the body that strikes the dashboard. Most frequently, injuries involve the face and knees. 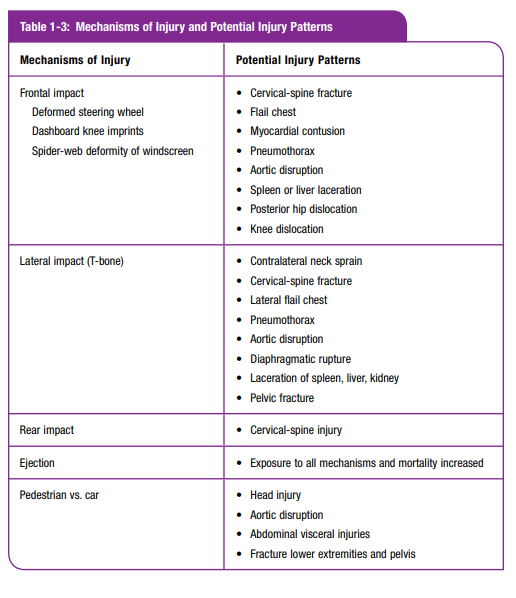 However, many types of injuries have been described (Figure 1-5). shock. Maintain a high index of suspicion, and always palpate the femurs, gently squeeze the pelvis, and palpate the symphysis pubis. 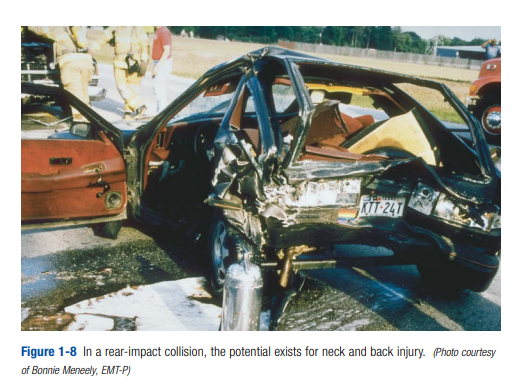 Deceleration collisions are most commonly associated with secondary collisions with people or loose objects in the vehicle, which can become missiles causing deadly injuries. 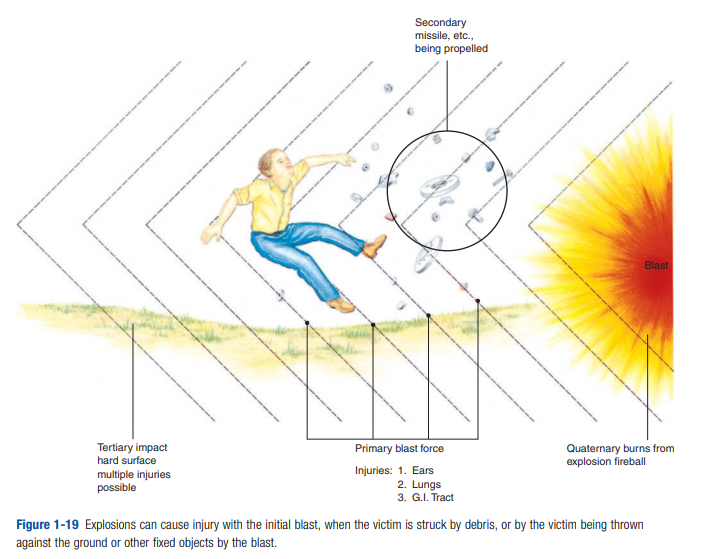 The mechanism of the lateral-impact collision is similar to that of the frontalimpact collision, with the addition of lateral energy displacement (Figure 1-6). • Head. Coup/contracoup is due to lateral displacement. • Neck. 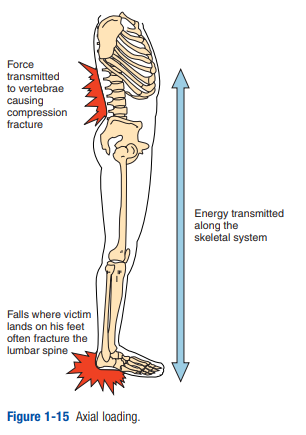 Lateral displacement injuries range from cervicalmuscle strain to fracture or subluxation with neurologic deficit. hemothorax, or possible traumatic aortic dissection. Abdominal injuries include those to solid and hollow organs. injuries may also include dislocation, bladder rupture, and urethral injuries. 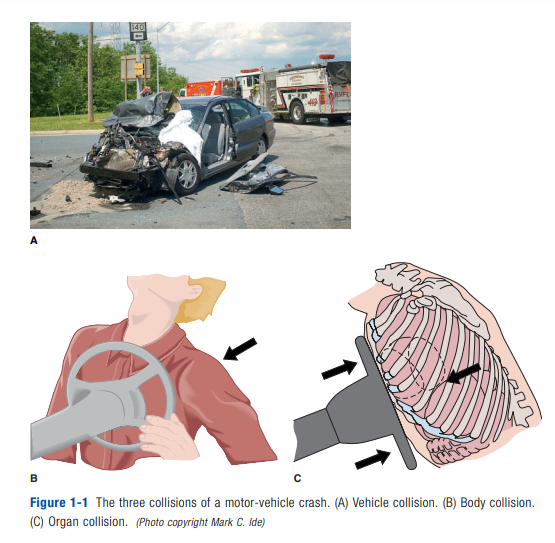 stationary car is struck from the rear by a moving vehicle (Figure 1-8). 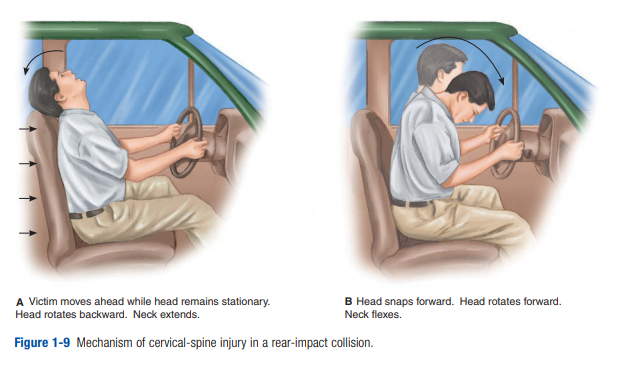 posterior displacement of the occupants and possible hyperextension of the cervical spine if the headrest is not properly adjusted. 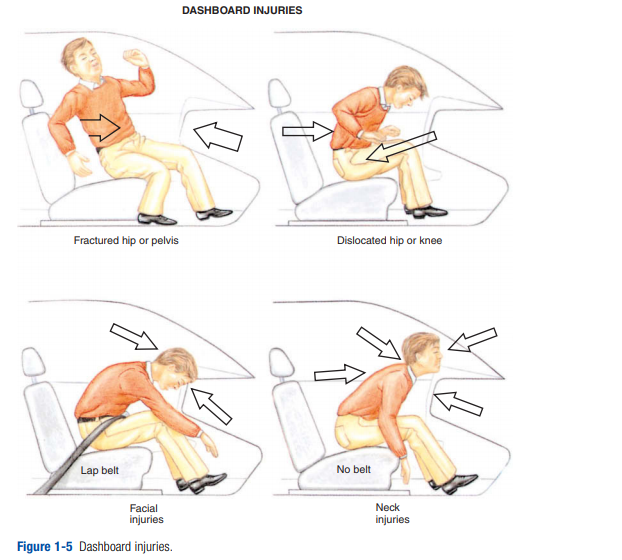 If the seat back breaks and falls backward into the rear seat, there is greater chance of lumbar-spine injury. Rapid forward deceleration may also occur if the car suddenly strikes something in the front or if the driver applies the brakes suddenly. Note deformity of the auto anterior and posterior as well as interior deformity and headrest position. 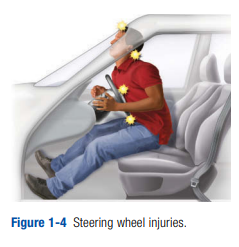 The potential for cervical-spine injuries is great (Figure 1-9). Be alert for associated deceleration injuries as well. 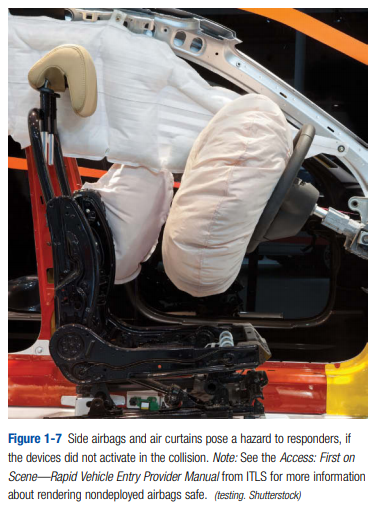 Restrained occupants are more likely to survive a collision, because they are protected by occupant restraint systems* from much of the impact inside the auto and are unlikely to be ejected from the auto. Those occupants are, however, still susceptible to certain injuries. *occupant restraint systems: systems built into a vehicle to prevent the driver and passengers from being thrown about the interior of the vehicle or from being ejected from the vehicle in the event of a collision. A lap belt is intended to go across the pelvis (iliac crests), not the abdomen. 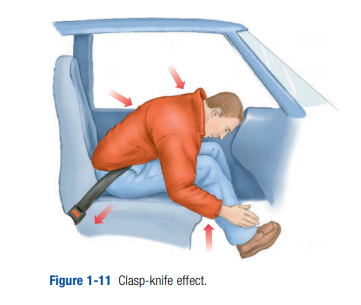 If the lap belt is in place and the victim is subjected to a frontal deceleration crash, the body tends to fold together like a clasp knife (Figure 1-11). chest-wall injuries. Internal organ damage may still occur due to organ movement inside the body. 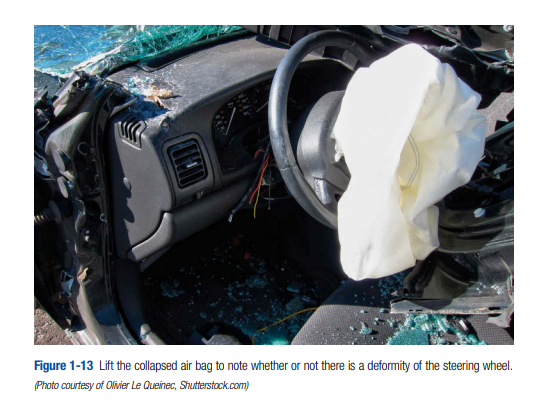 Like belt restraints, air bags (passive restraints) will reduce injuries in victims of MVCs in most but not all situations. Researchers have recently shown that some drivers who appear uninjured after deceleration crashes have been later found to have serious internal injuries. A clue to possible internal injuries to the driver is the condition of the steering wheel. A deformed steering wheel is just as important a clue in an auto equipped with an air bag as in those that are not. This clue may be missed because the deflated air bag covers the steering wheel. Thus, a quick “lift and look” under the air bag should be part of the routine examination of the steering wheel (Figure 1-13). Cars manufactured in the last few years now also include side airbags. They may be built into the body, seat, or headrest. 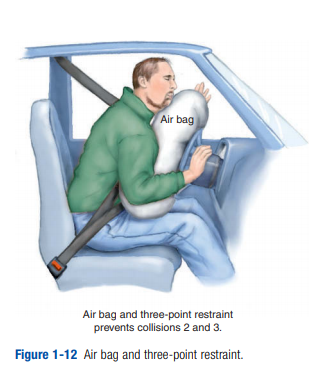 Just like frontal airbags, they only protect the driver during the initial collision. Some vehicles have air bags that come down from the roof to protect the head, and at least one make of auto has air bags under the dash to protect the legs. They obviously give much-needed extra protection. In summary, when at the scene of an MVC, note the type of collision and the clues (such as deformities of the vehicle) that imply high kinetic energy has been spent. 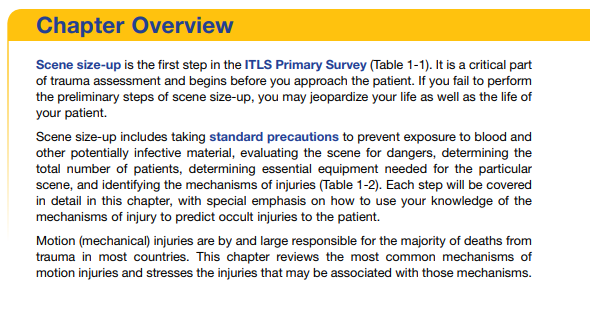 Maintain a high index of suspicion for occult injuries, and thus keep scene time to a minimum. In addition, knowledge of anatomy and physiology is essential. Focus on what injuries can be predicted, and appreciate that age and environment may suggest the probability of other injuries. Last, comorbidities (for example, diabetes, cardiovascular disease, chronic obstructive pulmonary disease) and medications (for example, anticoagulants) can make the case more complex and demanding. Those observations and clues are essential to quality patient care and must be relayed to medical direction and the receiving physician. It is extremely important for motorcycle riders to wear helmets. of protective encasement leads to a higher frequency of head, neck, and extremity injuries. Important clues to injury include deformity of the motorcycle, distance of skid, distance the rider was thrown, and deformity of stationary objects or cars. Often the rider is thrown onto the other vehicle in the collision and then sustains another impact when he or she lands on the roadway. A pedestrian struck by a car almost always suffers severe internal injuries as well as fractures. This is true even if the vehicle is traveling at low speed. The mass of the auto is so large that high speed is not necessary to impart high-energy transfer. When high speed is involved, the results are disastrous. There are two associated mechanisms of injury. The first is when the bumper of the auto strikes the body, and the second is when the body, accelerated by the transfer of forces, strikes the ground or some other object. An adult usually has bilateral lower leg or knee fractures plus whatever secondary injuries occur when the body strikesthe hood of the car and then later the ground. Children are shorter, so the bumper is more likely to hit them in the pelvis or torso. They usually land on their heads in the secondary impact. The classic pattern is referred to as Waddell’s Triad, in which the bumper causes a femur or pelvis fracture. The child is struck in the chest by the fender or car body and sustains a head injury when striking the pavement. A similar pattern would be seen in adults, but the site of injury varies with the height of the victim. Head injuries are common in falls by children because the head is the heaviest part of the body and thus impacts first. from the knife and gun. 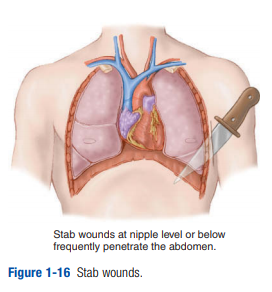 The severity of a knife wound depends on the anatomic area penetrated, length of the blade, and angle of penetration (Figure 1-16). golden rule with any impaled object is to stabilize it in place. It will be removed at the hospital. Impaled objects in the cheek of the face and those blocking the airway are exceptions to this rule. Blast injuries in North America occur primarily in industrial settings such as grain elevator and gas fume explosions but may also be from criminal or terrorist activity. 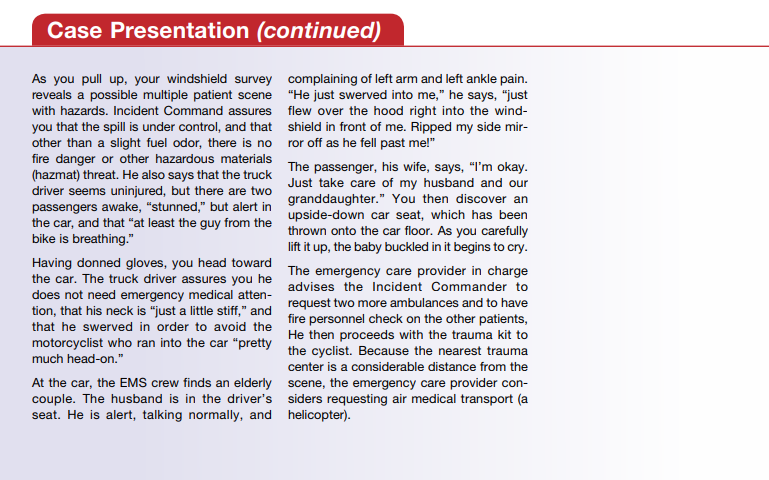 This entry was posted in International Trauma Life Support, Trauma. Bookmark the permalink.